« STARS & STRIPES OR TONGUES OF FIRE? This entry was posted on June 1, 2015 at 1:12 pm and is filed under Church Music, Congregational Singing, Leading Worship, Music Ministry, Singing Worship, Spiritual formation through singing, Worship Leaders, Worship Pastors, Worship theology, Worship thoughts, Youth Worship. You can subscribe via RSS 2.0 feed to this post's comments. Thank you, Paul. I’m totally with you…for Intergenerational worship. Blessed are the children who get that opportunity every week. Why would you EVER give a kid a cell phone to play games on during a service? My kids can do that at home. They need to be in a learning/growing environment! Not to mention we have lost all sense of teaching children respect for God if we are allowing them to “play” during church! I say Amen to this as far as children are concerned, which of course is what you are addressing. But babies–now that’s a different story. I am a firm believer in babies being put in the nursery during worship services. I have seen far too many services disrupted by screaming babies or by cute well behaved babies that people sitting around them want to watch and focus on instead of worshiping the Lord. I have two children of my own, 5 and 6 months. Our 6 month old goes to the church nursery every week and this gives my wife a chance to worship and hear God’s Word without having to worry weather the baby will get upset and begin to cry. Our 5 year old sits with my wife until halfway through the service when the children all leave for what we call “Children’s Church.” This again gives my wife the ability to listen attentively to the sermon and enables her to respond as God leads her. She doesn’t have to worry about a 5 year old asking for paper and a pen, rolling all over her lap, or ask to go to the bathroom. Now, in our Children’s church our children hear a Bible lesson that is on their level and easy for them to understand. We often ask our 5 year old after church what she learned in Children’s church and she is able to tell us. So she is learning about God and from God’s Word in Children’s church. Now, you may have picked up on the fact that I said our five year old sits with my wife and you may think, “Why are you not there to help out with your child?” Well it’s because I am standing behind the pulpit, I’m the pastor. So, take it from a pastor who has children and cares about the spiritual condition and depth of the children in the church he pastor’s, if I did not see children’s church as a beneficial thing we would not do it. I leave you with this, you mentioned that only when children are in the sanctuary worshipping with parents and grandparents can they learn and ask questions about what is occurring. Church is not the only place that learning is to occur. Deuteronomy 6:7 says, “You shall teach them (God’s law, God’s Word) diligently to your sons and shall talk of them when you sit in your house and when you walk by the way and when you lie down and when you rise up.” We should take every opportunity to explain baptism, the Lord’s Supper, salvation, God’s Word, etc. to our children and not just in a corporate worship service. The post is not intended to infer that corporate worship substitutes for teaching our children “when you sit in your house and when you walk by the way and when you lie down and when you rise up.” I think you have misread if you think the post is saying “only when children are in the sanctuary worshipping with parents and grandparents can they learn and ask questions…” Rather this post is just that, a blogpost (not a book or full treatise), and is intended to prompt consideration of issues related to worship, in this case regular corporate congregational worship. Believe me, I understand the situation with your family as a pastor for I, too, spent my first 26 years of ministry on the platform while my wife was in the pew with our three children who are now all grown. I, myself, was a “P.K.” (preacher’s kid) and sat on the second row so my mother could see my brother and me from the organ bench. 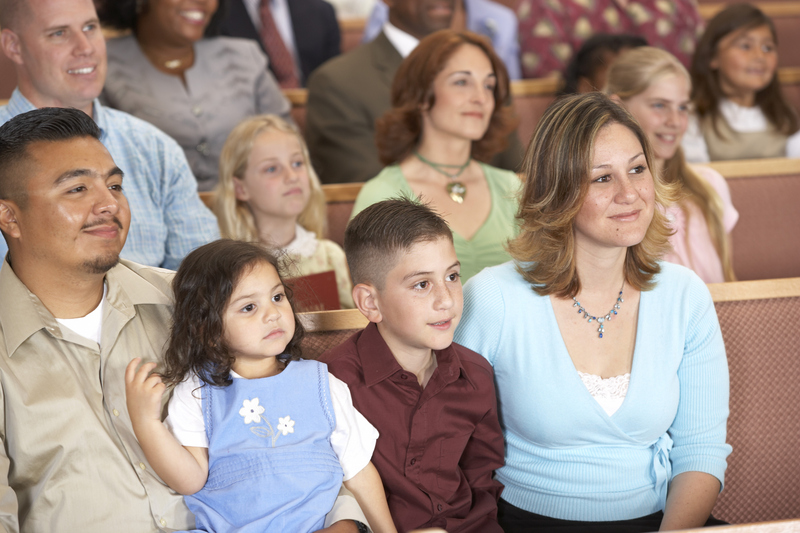 The post is intended to prompt church leaders and parents to consider what happens when we separate children out from public gathered worship, and especially to confront a common practice of offering “Worship Kids Style” throughout the childhood years, leaving a chasm where intergenerational worship is outside the regular experience for children or adults. So thank you for adding your reminder to us that what takes place in corporate worship is most effective when consistent with what is experienced in the home. Thank you for your comment/reply. I understand what you are saying about people coming to church with a “Burger King – Have it you way” mentality. That consumer mentality is a product of the world in which we live. We are constantly bombarded with messages and images that tell us, “This is your life be who you want, do what you want, ect.” Now, I will admit, if the church is not careful it can aid in feeding that consumer mentality. When church members say I want worship this way or want it that way and church leadership listens to them rather than following God’s leading in that church it does feed the consumer mentality. For our church, however, offering Children’s church is not seen as something to please or entertain our children, it is seen as another avenue for us to present the gospel to children you might not grasp it in a cooperate setting. With that in mind I pose this thought to the discussion: Churches should look at the cultural context around them and determine the best avenue(s) they can use to present the gospel. Understand I am not advocating changing the message of the gospel merely the style in which it might be delivered. The apostle Paul practiced this himself: “To the weak I became weak, that I might win the weak; I have become all things to all men, so that I may by all means save some” (1 Corinthians 9:22). As a worship leader for 4th and 5th graders in a large church, I think it’s better for the kids to be separated most of the time. It’s not just about the worship, but also about the message. Very few 4th and 5th graders (8th grade and below for that matter) will understand the message in the larger gathering, which is why they call it boring. The children’s ministry at our church does not replace our command in Deuteronomy 6; rather it is a partnership with parents. Ultimately, it’s still up to the parents to act on the scripture and engage in age appropriate dialogue with their kids discussing, what they’ve learned. We’ve been at this church going on 10 years now and have not seen the kids with the entitlement mentality of which you speak. (They may be around, but I haven’t seen them) Rather, I see maturing kids, preteens, adolescents, high schoolers, and fully devoted (adult) followers of Christ…we watched these kids grow up, and now they contentedly sit in the large group gathering by themselves or with their families. What you’ve laid out here COULD happen, but in our experience is the outlier. I submit that if you were just interested in starting a discussion then leaving “no millstone for me” out of the title would help. Those of us who are dedicated to children’s ministry are carrying on the tradition of Christ teaching by parables-talk in language they understand so they will get the WORD. Not all Children’s Church services are as you described. In our church the children are taught in a manner more suited to their age. They hear bible stories, sing, and have a lesson that they also bring home for parents to see what they are learning. We usually go over these at bed time. My four year old definitely would not understand the same lesson she learns in children’s church if she were to hear it in a sermon in “big church”. It is definitely not only about “treats, songs just for them, and fun people”. These children are learning. I am a pastor’s wife in a rural, small town church. We often have kids from the community whose parents don’t come yet. The kids stay downstairs with us for song time and go upstairs with me for Children’s church on Sundays. Even here in the states, many of these kids have never heard basic BIble stories such as David and Goliath and their ideas of heaven and who God is are all tangled up with the movies or TV shows that they’ve watched. In Children’s church we spend time teaching the beginning doctrines of who God is and what He is like. We want to clear up the confusions and help them understand. For the kids whose parents come, those parents are able to stay in the service and listen. It’s a way for us to minister to them as a family. I think both sides are ok. I remember sitting in a church one day behind a family of seven. Nice family till the sermon began. when it did a ruler appeared from Mum’s bag. She was focussed on the toddler and every time he made a noise or moved from his allotted position he got slapped with that rotten ruler!! This was thirty years ago and I often wonder if he knows the Lord or goes to church after that introduction to the Love of God. I watched with horror at how she was training up her child and honestly wanted to grab the ruler, slap her on her behind a few times then break the stupid thing!! Sorry, I was a lot younger then, way more feisty, and less likely to stop and think ‘What would Jesus do’. I had my toddler and new born with me, my husband and my dad and the babies just cuddled throughout the entire service. I know the mother was way over the top with her discipline, but I’d rather send my kids out to Children’s Church if they wanted to go. If they didn’t. Fine. God can plant His seeds of love in little hearts anywhere there is someone to tell them, especially when their parents who love the Lord are their main teachers of the wonderful and awesome love God has given the world thru Jesus. We raised 4 children in church with the blanket on the floor between our feet method keeping quiet and under control with the occasional walking out of the service to settle them down if there was a disturbance and came back in when they had settled. Please don’t say we were just lucky we ” trained our children in the way they should go” ? They all have grown well adjusted and no they were nit exceptionally or naturally behaved or quiet but they learned to be.please don’t say they were exceptions because it took consistency and determination on our behalf to achieve this.